Mercury, the planet closest to the Sun, is a small world almost entirely devoid of atmosphere. Its proximity to the Sun means that at perihelion, when it is only 0.31 AU from the Sun, the equatorial temperature at noon is about 725 K, though just before dawn the absence of an atmosphere leads to a frigid 90 K. Mercury rotates three times during two orbits of the Sun, giving a mean solar rotation period (Mercury's solar 'day') of 176 days. It is the tidal force of the Sun that has slowed Mercury's rotation to the point where it is now in this 3:2 resonance. Mercury is much less well explored than the Moon. It is very difficult to see much on the surface of Mercury with ground-based telescopes, and with a maximum orbital elongation of 28° it is always too close to the Sun to be viewed by the Hubble Space Telescope. The Arecibo radiotelescope is not constrained in this way, and has imaged the hemisphere unseen by Mariner 10, but at low resolution. The only spacecraft to have visited the planet was the flyby mission of Mariner 10, twice in 1974 and again in 1975. Only 46% of the surface was imaged, with a resolution of about 100 m - about the same as that of the Moon in the larger Earth-based telescopes. Earth-based radar has indicated that the altitude range on Mercury is around 4-5 km, but with a large uncertainty. We have no samples of the Mercurian surface, though the remotely sensed properties of the surface from Mariner 10 and from the Earth are consistent with dusty basaltic silicates everywhere, plus iron sulphide. This makes it rather like the lunar fines. Mercury is a dark world, though not quite as dark as the Moon, and it is generally more uniform in its albedo, not displaying the maria-highlands contrast of the Moon. The albedo (at visible wavelengths) over much of the surface lies in the range 10-20%. The surface of Mercury is dominated by impact craters (Plate 4), ranging from small bowls at the limit of resolution up to huge impact basins. Mercurian impact craters are broadly similar in form to those on the Moon, the main differences being attributable to the higher gravitational field at the surface of Mercury, 3.7 ms-2, compared with 1.6 ms-2 on the Moon. □ What effects on the craters should the higher field have? Among the expected effects of higher gravity are that, for surfaces with similar compositions and compaction, the craters will be smaller for given projectile kinetic energy, and ejecta will be flung less far. Also, the diameter ranges of the various crater morphologies in Figure 6.10 will be different. Though these expectations are borne out, closer inspection reveals further differences between Mercurian and lunar craters, presumably because the two surfaces have somewhat different properties. Also, though the distributions of sizes are not hugely different, such differences as there are remain largely unexplained. Some craters are fresh, with bright rays of ejects, the brightest features on Mercury. Others craters are degraded. Gradation of Mercury's craters has occurred in various ways. Ejecta from more recent craters partially obscures neighbouring older craters, and many craters show evidence of infill that has created so-called smooth plains - in many cases this infill might be lava. Larger craters show evidence of isostatic adjustment. There has also been mass wasting, presumably a result in part of seismic activity. The paucity of craters greater than about 50 km in diameter suggests that the crust might have been rather soft early in Mercury's lifetime, leading to viscous relaxation. This occurs in any solid substance warm enough to flow slowly under its own weight, and the effect is exaggerated if the lithosphere is thin. The number of large basins (300-1000 km diameter) is much the same as on the Moon, but they are more subdued because of burial and infill. The largest basin, indeed the largest structure on the surface, is Caloris, a multi-ring basin 1300 km across, with ejecta reaching as far again beyond the outer rim (Figure 7.5(a)). The infill is a mixture of ejecta and impact melt. Caloris also has smooth plains thought to be lava flows, an interpretation supported by the possible presence of lava channels. The smooth plains seem to have been modified by isostatic adjustment, by magma withdrawal, and by tectonic processes. Diametrically opposite the Caloris Basin is a unique region of hilly terrain criss-crossed by linear features (Figure 7.5(b)). On a smaller scale, radar studies from the Earth show this region to be very blocky, or fractured. It is thought to be the result of the focusing by a large and dense planetary core of seismic waves from the Caloris impact. This is further evidence for the large iron core postulated in Section 5.1.3. The Caloris impact was probably the final major impact. About 40% of the 46% on Mercury's surface imaged by Mariner 10 consists of large craters, basin rim structures, hilly terrain, and terrain with roughly linear topography. 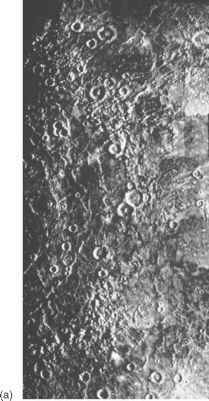 These Mercurian highlands constitute the analogue of the lunar highlands, and constitute the heavily cratered terrain. The more heavily cratered areas in Figure 7.6 and in Plate 4 are examples. □ What could have caused this type of terrain? This terrain is considered to be left over from the terminal phase of the heavy bombardment, as in the case of the lunar highlands. Basin they are also found elsewhere on Mercury, such as in other basins and in large craters (like Petrarch in Figure 7.5(b)). The less cratered half of Figure 7.6 is an example of where the smooth plains are found exterior to impact basins and large craters. Though the name suggests that the smooth plains are flat and sparsely cratered, they are more heavily cratered than the lunar maria, which are the least cratered areas on the Moon. The cratering density is similar on all such plains, suggesting that all are of much the same age. This is estimated (from the lunar cratering record) to be around 3800 Ma, which is when the heavy bombardment was declining. Though ancient, the smooth plains are the youngest surfaces on Mercury, borne out by the relationship of smooth plains to adjacent material, which shows that the smooth plains came later. All of them could be lava flows, a suggestion supported by sinuous lobed ridges that could be the edges of lava sheets. The smooth plains seem to be the Mercurian equivalent of the lunar maria. The commonest type of surface on Mercury has no lunar equivalent. These are the rolling intercrater plains, so called because they lie between clusters of large craters (greater than about 20 km in diameter). Most are in the highlands, and in low-resolution images seem to have few craters. 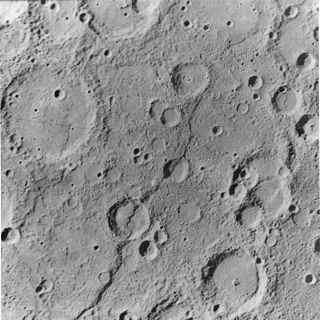 Many of the craters are secondaries, as indicated by their shallow, elongated forms and tendency to form clusters and chains. The less cratered areas of Plate 4 are intercrater plains. In fact, the crater density on the intercrater plains is much higher than on the smooth plains, the population being dominated by craters smaller than 10 km in diameter. The intercrater plains are therefore older than the smooth plains, with estimated ages of 4000-4200 Ma, which is during the heavy bombardment. The intercrater plains are probably of volcanic origin, rather than a result of erosion and deposition, or impact ejecta mantling. However, you should not envisage volcanoes and volcanic eruptions as creating these plains. Rather, at that early time, Mercury's lithosphere would have been thin, so we have subsurface magma emerging through fractures in the lithosphere, creating widespread flooding. It is quite possible that plain formation on Mercury was more or less continuous, from some time during the heavy bombardment to when the youngest of the smooth plains were created. Earth-based IR spectra have detected feldspars and perhaps pyroxene, which also dominate the lunar highlands (Section 7.1.6), though the detailed composition is different on Mercury. The seven times greater solar radiation and solar wind at Mercury also contribute to surface differences. These differences account for Mercury having a generally higher albedo than the Moon. The feldspar-rich surface supports the view that Mercury is highly differentiated. IR and microwave spectra have failed to detect basalts, which indicates that extrusive volcanism since Mercury acquired a crust has been rare. If so, then loss of internal heat by volcanic extrusion has not occurred, thus helping to sustain high temperatures in the interior. Mercury, with an axial inclination of zero, has permanently shadowed regions near the poles, like the Moon, that act as cold traps for migrating water. But unlike the Moon, there is good evidence, from Arecibo radar, that in these regions there is ice, at least 1 metre thick, under at most a thin layer of dust. How can Mercury have bodies of ice of moderate lateral extent, whereas the Moon might well not? This could be a result of greater cometary bombardment on Mercury, due to its position much closer to the Sun, and its lower water loss rate due to its larger gravitational field. A few craters have dark halos, as have a few craters on the Moon. Such craters might be volcanic, but in the case of Mercury better images are required to investigate this possibility. Arecibo radar has seen a dome on the hemisphere unseen by Mariner 10, which might be volcanic. Scarps are very common, 1-2 km high, and cross all types of terrain. Figure 7.7 shows part of the scarp Discovery Rupes. Ridges are also common. Together with the scarps they suggest planet-wide crustal compression. A 1-5 km decrease in the radius of Mercury could account for them, though some might be the result of more local tectonics and others could be the result of lava flows. Local crustal tension is indicated by a few graben and a few strike-slip faults. Mercury continues to cool slowly, so compressional features will grow, equally slowly, though on the basis of lunar cratering rates there has been little volcanic or tectonic activity on Mercury in the past 3000 Ma. (1) Any early magma ocean would have solidified by 4000 Ma ago, a crust having formed much earlier. (2) Though we have no radiometric dating for Mercurian surfaces, models indicate that the bombardment history of Mercury has been broadly similar to that of the Moon, and so the heavy bombardment of Mercury would have ended about 3900 Ma ago. particularly those around 50 km in diameter, to relax into oblivion, thus contributing to the creation of the intercrater plains. (4) The intercrater plains have ages of 4000-4200 Ma, and are largely the creation of lava flows. (5) The formation of the massive iron core and radiogenic heating warmed the interior sufficiently for an asthenosphere to extend up to the comparatively shallow depth of about 50 km, thus making magma available to the surface. Any early expansion of the crust during this heating phase is not seen in surface cracks, so it would have ended before the end of the heavy bombardment. (6) Crustal contraction created fractures, scarps, and ridges. Lava flows created more intercrater plains. The contraction could have resulted from cooling and shrinkage of an iron core, aided by lithospheric contraction. 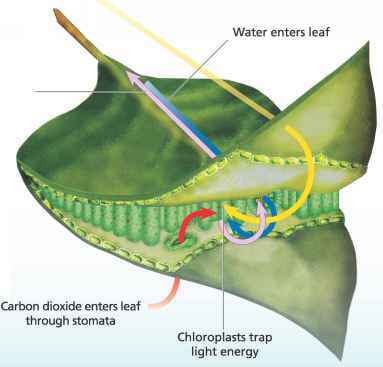 Fracturing could also have resulted from the stresses produced by the tidal slowing of Mercury's rotation by the Sun. If at this early time there was a molten iron core, then it must still be largely molten today, because the large crustal shrinkage that would have occurred on solidification would be preserved today, but is not seen. 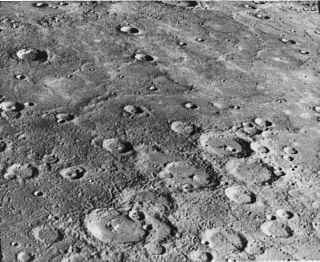 (7) The final stage of heavy impact cratering created Caloris and its associated features, rather as it created Mare Orientale on the Moon. (8) Subsequently, when the impact rate had declined somewhat, the smooth plains were emplaced, also through lava flows, and have ages around 3800 Ma. (9) The lithosphere gradually thickened, to about 200 km by 2000 Ma ago, and it continued to thicken thereafter. There might have been little volcanic or tectonic activity on Mercury in the past 3000 Ma. Discuss the factors relating to energy gains and losses that are relevant to the conclusion that the lithosphere of Mercury is thicker today than those of the Earth and Venus.